alaTest has collected and analyzed 76 reviews of Sony WF-SP700N. The average rating for this product is 4.0/5, compared to an average rating of 4.2/5 for other Headphones for all reviews. Reviews about the noise isolation and portability are generally positive. The comfort and usability are also appreciated, whereas many are negative about the price. We analyzed user and expert ratings, product age and more factors. 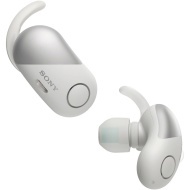 Compared to other Headphones the Sony WF-SP700N is awarded an overall alaScore™ of 96/100 = Excellent quality. At S$299, the Sony WF-SP700N wireless sports earphones aren't cheap but they do have some attractive features that make them worth checking out. The WF-SP700N are comfortable, well-functioning fully wireless in-ears, but short battery life and an oversized design keeps them off our list. Sony's WF-SP700N true wireless earphones are a rare misstep from a company that typically has much higher standards. Secure in-ear fit. Solid noise cancellation for the price. Poor audio performance. Short battery life. Low IP rating for gym-focused earphones. The Sony WF-SP700N sports earbuds take the strengths of last year's WF-1000X and mold them to a very different cause. Stable fit for sports. ; Compact and decently sturdy design. High latency. ; Poor noise isolation. The sporty WF-SP700N's battery life isn't so great, but it performs and fits well. Fits comfortably and securely and sounds good for truly wireless headphones. Built-in noise cancelling helps muffle ambient sound. An included charging case delivers two additional charges. Battery life is only OK at 3 hours. It's a little awkward to get the earbuds into their charging case. Some audio delay when using certain streaming video apps. Despite some small downsides, the Sony WF-SP700N is one of the better truly wireless headphones currently available.